Fabric spreading is a process of laying fabrics on the cutting table prior to the cutting process is taken place. In this article, I will discuss automatic spreading machines. When I visit large size garment factories, I observed their cutting section is equipped with automatic machines with the latest technology including automatic spreading machine. They work on volume production, speed to market and efficient systems. In mass garment production, several fabric plies are cut at a time. The quality of cut components, fabric consumption, and fabric wastage in the cutting process depends on how well spreading is done. If there are waves on the fabric layer, you will get defective cut component. There are number of parameters a factory needs to follow in the fabric spreading process – like, fabric facing, edge control, fabric tension, lay height, end loss, and splicing etc. Traditionally spreading is done manually where a number of helpers and spreaders are needed to draw the fabric, to lay the fabric and control the fabric edge on one side. Manual spreading is a slow process. The automatic spreading machine is available for the spreading process which yields better fabric utilization. The spreading machine is stationed at one end of the cutting table. Fabric roll or folded fabric stack is loaded on the spreading machine. Two persons are required when spreading is done using an auto spreader. The automatic spreading machine is operated by one operator and another person is required on another side of the spreading table. The second person checks the fabric edge, remove unnecessary creases on the fabric layer and collect end bits. The fabric spreader reaches to the end of the marker and starts laying the fabric on the table. 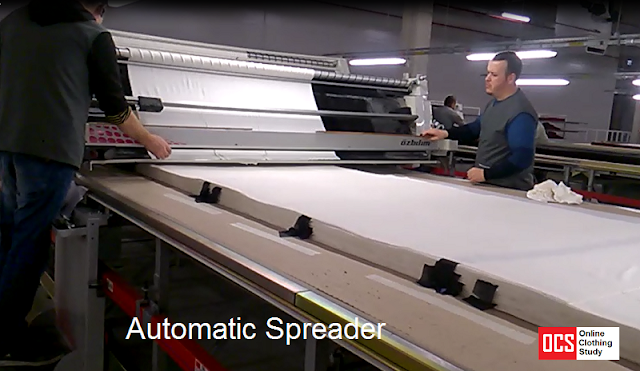 When the spreader reaches to other end of the marker, auto end cutter split the fabric from roll. By using auto spreading machine Face-up and Face-to-Face spreading is possible. to have detailed statistical of fabric spreading time, fabric utilization etc. Sharing two images of a manual spreading process and the spreading done by auto spreader in the following two images. Who needs an automatic spreading machine? Whether to use an automatic spreading machine or not, depends on the cutting production capacity level of your factory or your company? You should analyze the cost-effectiveness of purchasing an auto spreading machine. If you get orders only for short runs and daily cutting capacity is less, then manual spreading is fine. Both knits and woven fabrics can be spread using an auto spreader. When purchasing one automatic fabric spreader you should let the supplier know your requirement – like what types of fabrics you like to spread. I have seen one company who bought a branded spreading machine. After installation t, ey come to know that spreader is suitable for woven fabric only. Not suitable for knits fabric. So, they purchased another spreading machine for the knitting fabric spreading. Who wants digitized fabric spreading information and wants real time from the spreading process. There are many popular solution providers available for automatic spreading machines having varied features. A description of automatic spreading machine. Benefits of automatic spreading machine. A video of auto spreader.